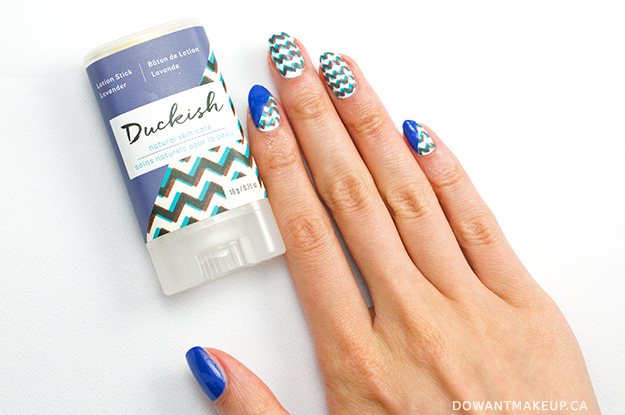 Inspired nail art time! 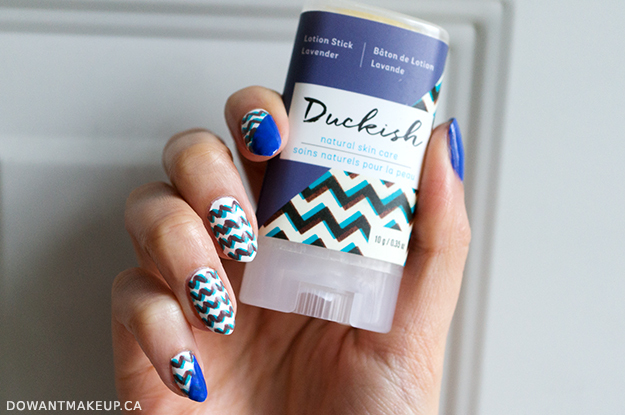 I picked the pattern in Duckish's lavender-scented products because I knew I had just the shades to fit the bill: Essie Chills and Thrills, Essie I'm Addicted, and Sephora Formula X in Perfection. Here's a closer look at the lavender pattern: the chevron is made from a bright blue zigzag underneath a dark brown zigzag. For some reason, I struggled a lot with wrapping my head around executing the offset chevron look. 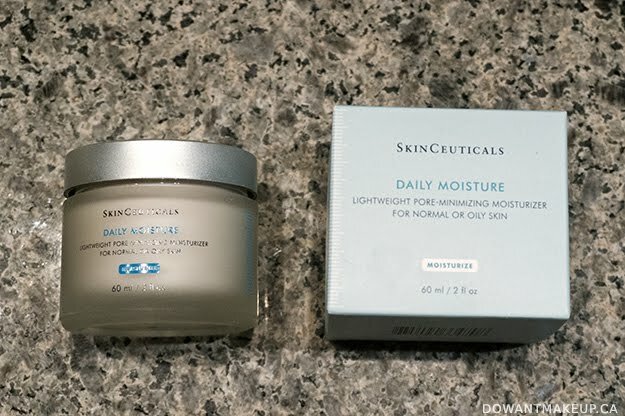 Finally, the last post in my three-part review of SkinCeuticals products! These are the last three of the products I received for review, and I'll also have some final thoughts about my experiences with the brand. 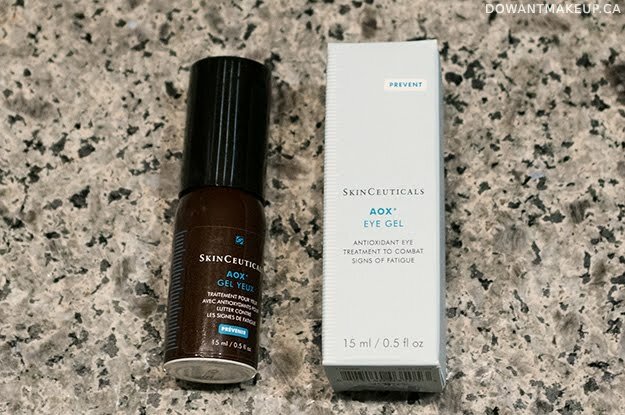 AOX+ Eye Gel is a complementary product to Serum 10 AOX+; they are both intended to provide antioxidant and anti-aging benefits to the skin using ascorbic acid (vitamin C) and ferulic acid. 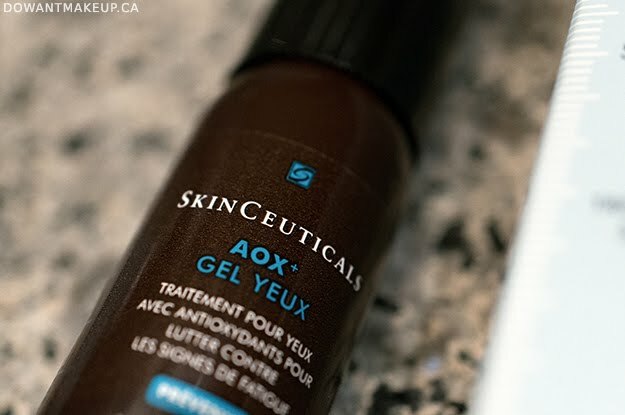 I previously mentioned that Serum 10 AOX+ has a very mild but bitter scent; the same odd scent is stronger in the Eye Gel, though it's not so bad that it's a deal-breaker. It also contains caffeine, which seems to draw mixed opinions about its efficacy as an eye de-puffing and anti-inflammatory ingredient, and butcher's broom extract, another possible anti-inflammatory ingredient. The presence of denatured alcohol worried me a little, but I didn't have any problems with it; I'm assuming/hoping it's there to help the beneficial ingredients penetrate the skin better. The gel texture absorbs easily and is suitable for daytime use. For night time, I would prefer something a little heavier. I appreciate the pump packaging that helps keep the antioxidant ingredients stable, but aside from hydration, I didn't really notice any difference in using it. Then again, my eye area doesn't have the inflammation or puffiness that the product seems to be targeting. I'm planning to use up my tube but I wouldn't be able to justify the $92 USD pricetag to repurchase. A common question I get: "how do you get your nails to look so nice?" The answer is actually kind of long and I swear I will get around to writing it out someday, but for now I'll share a little part of it: keeping your cuticles neat. The cuticle is that annoying dead layer of tissue that sits on your nail plate near where your nail meets your finger, getting in the way of nail polish application if you don't push it back. If there's a lot of it, you might find that you get almost a "wall" of dead skin along your nail after pushing it back. That's where the Tweezerman Professional Spiral Spring Cuticle Nipper comes in. Note that clipping your cuticles is somewhat controversial: some argue that the cuticle should never be cut, because it can increase the risk of the cut area getting infections and other bacteria in. On the other hand, I've been cutting mine for a while now and have also had pro nail techs nip them, all with no problems. Keep in mind that I'm not a professional and this is just what works for me! With that out of the way, let's get back to the product. 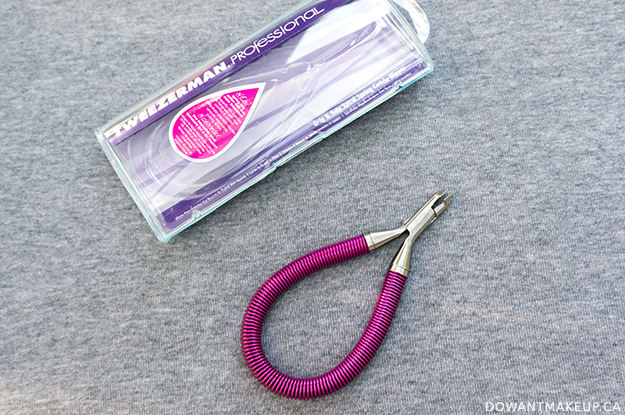 Tweezerman's Cuticle Nipper is stainless steel, with a good weight to it. It comes with a sturdy plastic case to store it in, as well as a small rubbery cover to protect the nipper part when not in use. The edges of the nipper are super sharp and clip through the dead skin of the cuticle very easily. I think I've been using mine for at least a year and it shows no signs of dulling yet. 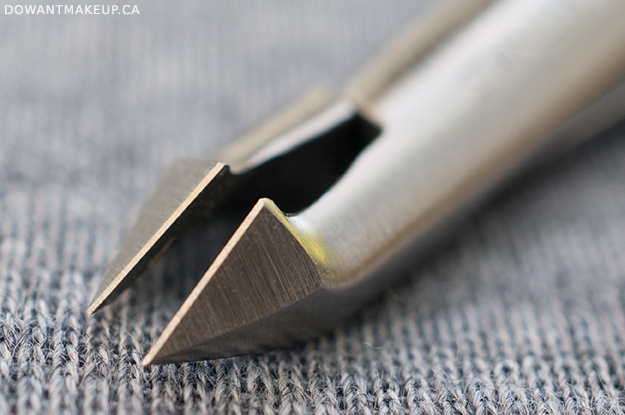 Once they do dull, I'll be sending them to get sharpened at Tweezerman HQ. This is a free service Tweezerman offers for their tweezers, nippers, and scissors, though you do have to pay for the shipping to New York. 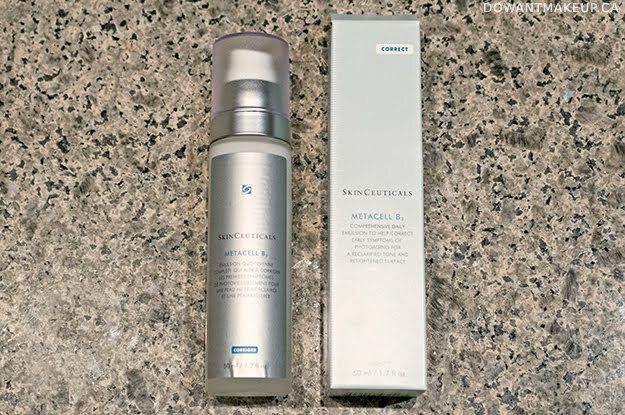 I'm (finally) back with more on SkinCeuticals! Today's post features products that could be broadly described as moisturizers that would be applied after using Serum 10 AOX+ or Retexturing Activator. 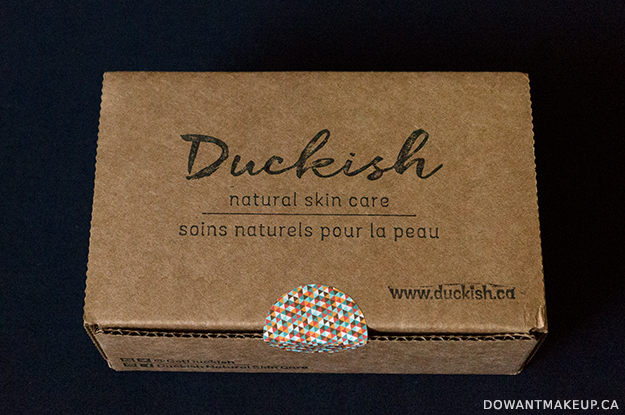 Daily Moisture is an oil-free moisturizer intended for normal/oily skin. The texture is light and easily absorbed, and the lotion-cream has a very, very mild scent, though I can't quite describe it. While the lotion has a pretty, pearly look in the frosted glass jar, I don't think it imparts any kind of pearlescent effect to the skin. 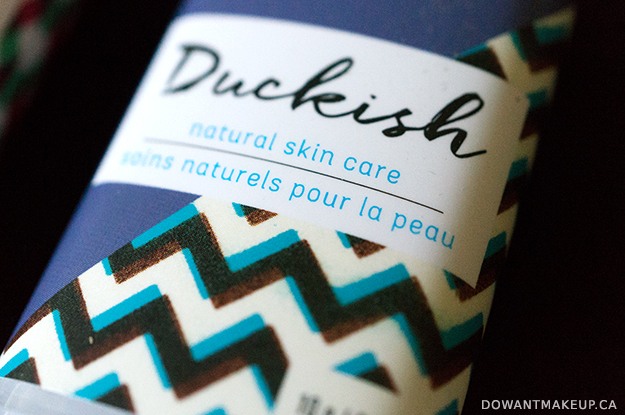 It leaves a smooth finish to the skin, so makeup applies well over top. 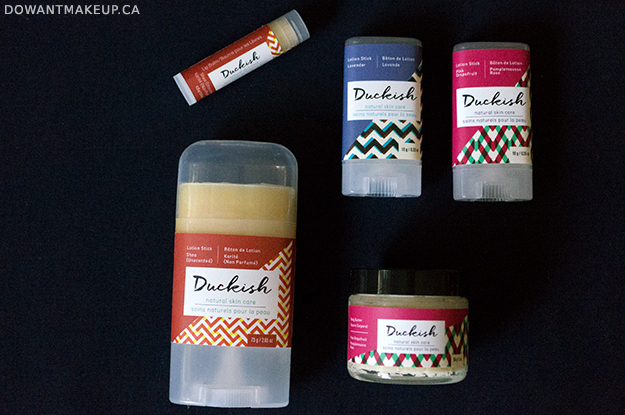 High on the ingredients list are glycerin (humectant), sorbitol (humectant), and cetyl palmitate (emollient). Other ingredients worth noting are sodium hyaluronate, licorice root extract (anti-irritant), and retinyl palmitate (antioxidant). Despite a pretty spiffy-looking ingredients list, I worry that the benefits of any antioxidants or plant extracts are not stable in this jar packaging. It's a nice moisturizer, but I don't consider it superior to other moisturizers I've tried that are at a similar or lower price point. 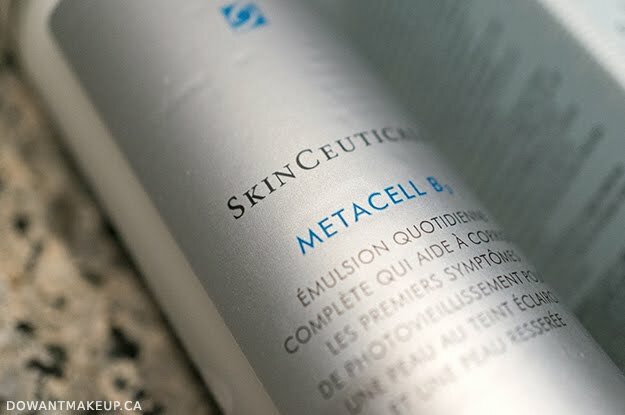 MetaCell Renewal B3 is a recent-ish addition to SkinCeuticals' "Correct" line-up of products intended to address issues such as slower cell turnover, environmental damage, and fine lines, all in an airless pump tube. This product boasts 5% vitamin B3, aka niacinamide, which has tons of benefits including improving skin elasticity and barrier function. Note that using a product with niacinamide together with acidic products can cause some flushing; I've tried it on separate occasions after Serum 10 AOX+ (vitamin C) and AHA products and had a little bit of flushing but it calmed down within a minute. 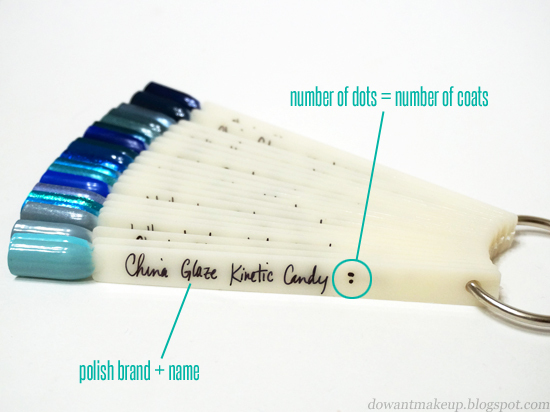 Four years ago, I posted about how I finally figured out a pretty good system to keep track of all the shades, finishes, etc in my nail polish collection. 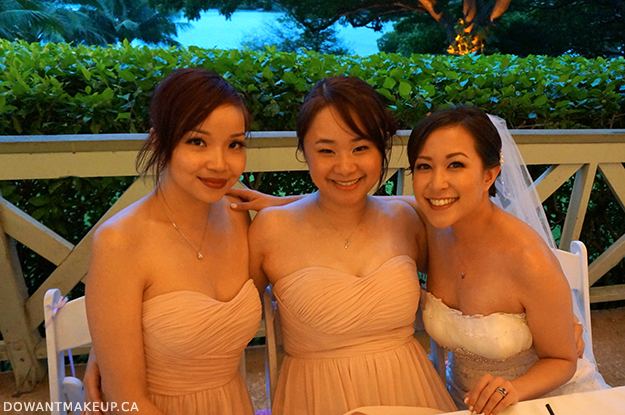 To date, it is still one of my most popular blog posts. It has been a super convenient resource when I'm picking out polishes and comparing one similar shade to another. Anyway, I thought it would be cool to share what my swatch system looks like now (hint: it's gotten a lot bigger). There are a lot of photos because I had way too much fun photographing this. I have 7 rings right now, organized by colour: pinks/reds, oranges/yellows, greens, blues, purples, glittery top coats, and neutrals. 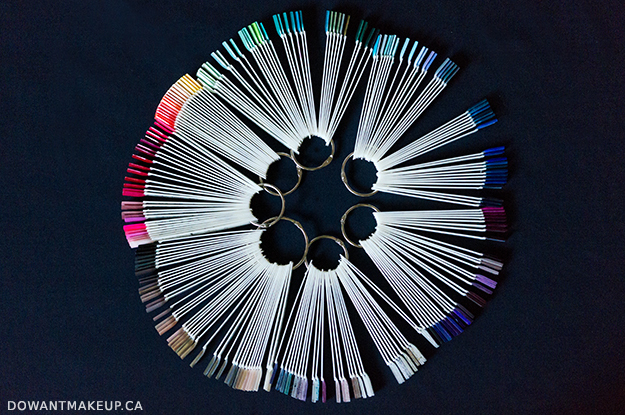 Neutrals is the biggest ring because it encompasses colours like black, white, beige, grey, metallic foils, etc, but my blues and greens also need to be upgraded to bigger rings.